According to a study published online in Cell, the links between obesity, insulin resistance and type 2 diabetes can also reveal the connection between cancer and obesity. The research was co-led by Dr. Jung-whan (Jay) Kim, a scientist and an assistant professor at the University of Texas at Dallas (UT Dallas), and by scientists at the University of California, San Diego. The researchers managed to genetically engineer mice that specifically lack a protein (HIF-1 alpha) in their fat cells. This protein is crucial for the development of insulin resistance and type 2 diabetes in obese mice, and although the HIF-1 deficient mice became obese when fed a high-fat diet, they did not develop insulin resistance or diabetes to the same extent that normal obese mice did. Dr. Kim explained that obese humans are prone to developing insulin resistance and diabetes, and that HIF-1 alpha, or hypoxia inducible factor-1, plays a central role in the development of these diseases. He also explained that HIF-1 alpha is crucial in the context of hypoxia (or low oxygen), which can occur in human cells in different contexts, such as in obesity, where fat cells are in a chronic state of hypoxia. 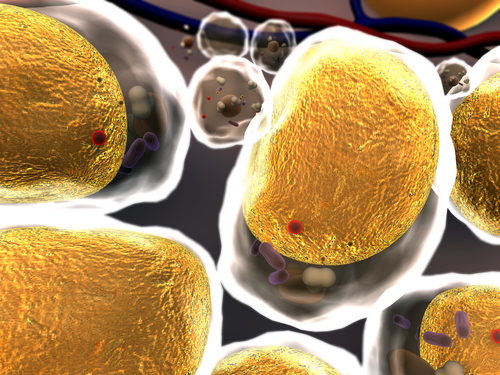 Cells consume oxygen to produce energy, however, with hypoxia they switch their metabolism and instead produce a reactive oxygen species, which can inflict damage to healthy cells. To prevent such damage, hypoxic cells activate HIF-1 alpha, shutting down the production of reactive oxygen species and recruiting inflammatory cells to the hypoxic areas to “clean” damaged cells. The constant activation of HIF-1 alpha leads to chronic inflammation in the adipose tissues in obesity. The research team observed that there was less inflammation in the fat tissue in the HIF-1 alpha deficient mice, and that although these mice were still obese, they had a better response to insulin when compared to the normal-control mice. At the same time, Dr. Kim noted that one of the major motivations for conducting this study was to understand the link between obesity and cancer. It is a fact that obese people have greater chances of developing certain types of cancer, although the reason why is not yet understood. It is known, however, that, just like obese tissue, tumor cells are highly hypoxic and dependent on HIF-1 alpha in order to survive under these conditions. If HIF-1 alpha could be specifically deleted from these cancer cells, they could no longer survive. Several pharmaceutical companies are already developing a specific HIF-1 alpha inhibitor that, if successful, could be used in the future to treat not only insulin-resistance and type-2 diabetes, but also cancer.